On July 11, 2012, at a General Assembly of the Leeds City Government, UK Falun Gong practitioners recounted the Chinese Communist Party (CCP) persecution of Falun Gong to the Mayor of Leeds, nearly 100 councilors, and a dozen senior officials of the municipal government. They asked the Leeds Council to make a public statement calling for an end to the CCP persecution of Falun Gong. The proposal was supported unanimously by a show of hands, successfully reaching the next stage of discussions. Because the Chinese Olympic delegation was training in Leeds ahead of the London Olympic Games at the time, Falun Gong practitioners’ call for an end to the persecution in the Leeds City Council attracted considerable attention from local media. 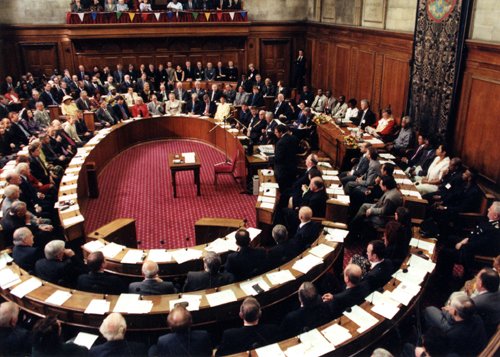 The General Assembly of the Leeds City Council generally meets once a month. Local residents in delegations of five or less can speak for five minutes on issues that concern them in front of up to 100 councillors and municipal officials. The City Council will decide with a show of hands whether the issues raised by the residents are worthy of further attention and discussion. The Falun Gong delegation was made up of three British practitioners of Chinese origin and two Western practitioners. Mary, their spokesperson, told the councilors about the CCP’s 13 years of brutal persecution of Falun Gong practitioners since July 20, 1999, including the atrocities of live organ harvesting and citing cases of persecution in Leeds’ sister city of Hangzhou. She called for the City Council to issue a solemn declaration to help stop the persecution of Falun Gong practitioners in China. Every councillor listened attentively, and her presentation generated great concern on the part of the councillors on the floor. When she finished, the audience responded with a warm round of applause. The councillors raised their hands unanimously to accept this subject for further discussion. This General Assembly was held just days after Chinese athletes arrived in Leeds to train for the Olympics. Some councilors had been worried about antagonizing the CCP authorities by accepting the local Falun Gong practitioners’ request to petition at the assembly. In their letter the practitioners wrote, "This is, in fact, an opportunity for you to make a piece of glorious history for the City of Leeds." After emergency discussions and thorough consideration, the Chief Executive of the City Council at last decided to allow the Falun Gong delegation to clarify the truth at the meeting. Meanwhile, from July 6 to 16, local practitioners held the Truthfulness-Compassion-Forbearance International Art Exhibition at the Leeds Corn Exchange in downtown. The Anglican Bishop of Ripon and Leeds, John Parker, performed the ribbon-cutting ceremony for the exhibition. Numerous councillors attended the exhibition and were deeply touched. Falun Gong practitioners’ presentation at the City Council also attracted the attention of the local media. Both the Yorkshire Evening Post and the Leeds Citizen carried stories about the scheduled Falun Gong presentation at the City Council and the Truthfulness-Compassion-Forbearance International Art Exhibition.